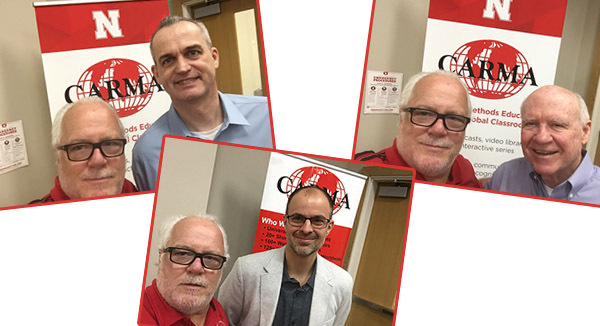 Dr. Larry Williams never misses an opportunity to 'selfie it up' with CARMA guest speakers. The Consortium for the Advancement of Research Methods and Analysis (CARMA) held several lectures in October and November. The October events started with the Global Scholar Series, a new benefit of 2018-19 CARMA membership. As a supplement to the regular webcast series, the new series aimed at increasing awareness of the important methodological work continually done by researchers from outside the U.S. This series featured a set of one-hour lectures on introductory and advanced quantitative and qualitative research topics recorded at the home location of global scholars. Dr. Jeremy Dawson from the University of Sheffield delivered the first lecture on Interpreting Interaction Effects. The events continued with the CARMA Research, Methods and Better Science Panel. This series consisted of four virtual panel sessions focusing on changes in research and methods and featured top organizational scholars who are leaders of this change within four academic communities included Society for Industrial Organizational Psychology, Responsible Research for Business and Management, Strategic Management Society and Academy of International Business. They shared their views on the reasons behind why these changes are critical for our future success, and their recommendations for specific actions by those in the research ecosystem. The panel sessions are delivered live via a virtual classroom for group viewing, with recordings subsequently available for individual viewing. The first event featured a panel presentation on the topic of Robust and Reliable Research by SIOP members, Dr. Steven Rogelberg, Dr. George Banks, Dr. Ron Landis and Dr. Fred Oswald. Events in October ended with two webcasts. During the two talks, Dr. Andreas Schwab from Iowa State University, and Dr. Joe Hair from the University of South Alabama, brought their expertise to more than 125 member institutions of CARMA. Schwab presented Why and How to Replace Statistical Significance Tests with Better Methods. Hair discussed Partial Least Squares Analysis. The recordings of these lectures are available in the CARMA Video Library. The Global Scholar Series brought Dr. Heiko Breitsohl on November 5, who presented on SEM and Experimental Designs. The final webcast wrapped up the fall semester when Dr. Scott Tonidandel from the University of North Carolina-Charlotte visited on Friday, November 16. Tonidandel discussed Mining Text Data. The "Meet the Methodologist" interview with Tonidandel is available online. The entire list of lectures for the 2018-19 year is listed on the CARMA webpage. For more information, visit: https://business.unl.edu/outreach/carma/member-events/.